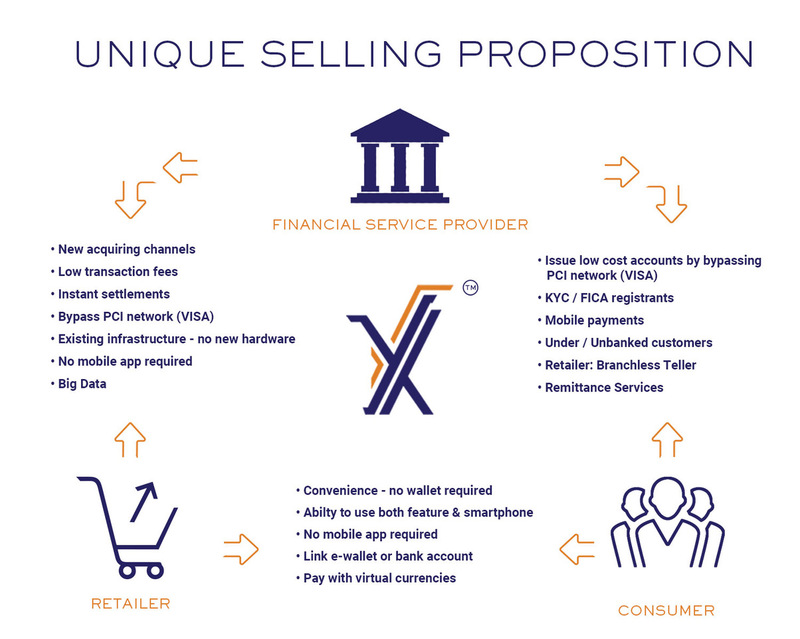 The XAGO platform is an open loop settlement platform which enables organisations to transact in the blockchain economy using their existing hardware and software infrastructure. Our innovative platform provides consumers with a low-cost, fast, efficient and secure payment method, whether that be paying for items at the till, buying airtime, sending money locally or internationally or transacting with cryptocurrencies, all of which can be done using their mobile phone (feature or smart). Our platform bypasses the Payment Card Industry network (PCI) allowing for significantly lower transaction fees and near-real time settlement using the Ripple Ledger. XAGO enables transactions via the PED (Pin Entry Device) with customers simply entering their phone number and personal pin. It uses the retailer’s existing switching software to route transaction data to the XAGO core server for authentication and processing. XAGO then instructs the customer’s financial services provider to debit the customer’s account and make a transfer of value using digital assets to settle the transaction. This platform allows the retailers who own their own switching software to bypass the acquiring bank during the processing of transactions. XAGO enables transactions online with customers entering their phone number and personal pin. A secure page routes transaction data to the XAGO core server for authentication and processing. XAGO then instructs the customer’s financial services provider to debit the customer’s account and make a transfer of value using digital assets to settle the transaction. Please enquire here to learn more about how to accept cryptocurrencies as a payment option for your store at the point of sale. XAGO has agreements with various stakeholders within the ecosystem including cryptocurrency wallet providers and cryptocurrency POS terminal providers whose customers will be able to pay for goods using cryptocurrency through our platform.